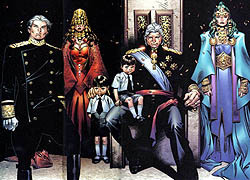 "House of M" is a 2005 comic book storyline published by Marvel Comics. The storyline consists of a core eight-issue comic book limited series written by Brian Michael Bendis and illustrated by Olivier Coipel, and a number of crossover tie-in books. Its first issue debuted in June 2005 as a follow-up to the events of the "Planet X" and "Avengers Disassembled" storylines, in which the mutant superhero Scarlet Witch suffered a mental breakdown and tried to alter the fabric of reality to recreate her lost children. Scarlet Witch's father, Magneto, and her twin brother, Quicksilver, played major roles in the series. Like the 1995–1996 "Age of Apocalypse" storyline, "House of M" replaced the Earth-616 as the main reality for a brief time until Scarlet Witch reverts to normal. The events of the storyline were later indicated to have occurred on Earth-58163. The first issue was released in June 2005, with the series concluding in November 2005. The first two issues were ranked first and second in sales in the June 2005 period, with the first issue selling over 233,000 copies. The final issue, House of M #8, was ranked third in sales for the November 2005 period with sales of 135,462. In addition to the main eight-issue limited series, House of M was preceded by a story in Excalibur #13–14, and had several tie-ins to ongoing series, including Uncanny X-Men, New X-Men: Academy X, and Wolverine, and several miniseries: Fantastic Four: House of M,The Incredible Hulk: House of M, Iron-Man: House of M, Mutopia X: House of M, and Spider-Man: House of M.
Bendis, lead writer for the House of M event, stated that the series would "shake the world and break the Internet wide open." Prior to the event, Bendis also mentioned in several interviews that the event would have a lasting effect on the Marvel Universe, but remained tight-lipped as to what. The crossover was followed by a one-shot called House of M: Decimation – The Day After, a series called Son of M that depicts Quicksilver dealing with his loss of powers, and Generation M, which devoted each issue to a different mutant dealing with the loss of their powers. Characters who appeared include Chamber, Jubilee, and Blob. Characters who lost their powers included Dani Moonstar, Magneto, and Tag. The storyline also led to the reboot of Excalibur into New Excalibur, a shift in the creative teams of several comics, and the debut of several spin-off series, including X-Men: Deadly Genesis, X-Men: The 198, Sentinel Squad O*N*E, Ms. Marvel, and a new X-Factor series. In this world, Magneto was attacked by Sentinels over Manhattan in 1979 (taking advantage of Marvel's sliding timescale policy, there are no heroes active in the 1970s). At the end of the attack, Magneto revealed an alleged international anti-mutant conspiracy involving Richard M. Nixon. As a result, Magneto was granted sovereignty of the island of Genosha as the leader of the world's mutants. Another result was that the protection of mutant life was judged to be the first worry of all laws (as a result, stem cell research on mutant embryos is illegal, but stem cell research on altered human embryos is permitted). Because of this, the world is a racist society, with mutants controlling governments, businesses, and culture, and humans (or "sapiens") are looked down on as inferior (essentially a reversal of the status quo in the mainstream Marvel Universe, where mutants are looked down on and despised instead). Some exceptions apply to "sapiens" who live with privileges like Carol Danvers (Ms. Marvel in Earth-616 continuity, but Captain Marvel in the World of M) and Peter Parker (Spider-Man). Danvers is widely known to be a "sapien," while Spider-Man is believed by the House of M world at large to be a mutant. Given that the House of M reality was created by the Scarlet Witch and Charles Xavier combining their powers to give the assembled New Avengers and X-Men their hearts' desires, it appears that Magneto's heart's desire was threefold. Primarily, he wanted the entire world to acknowledge that his paranoid fantasies about baseline humans wanting to exterminate mutants were true (hence the Sentinel attack over New York in 1979, which concluded with the release of evidence that the world's human leaders were involved in a genocidal anti-mutant conspiracy). Secondly, he wanted to be acknowledged as a heroic figure and the rightful leader of all mutantkind (hence the disappearance of Charles Xavier and the timing of Magneto's rise to dominance before other superheroes had appeared on the scene to challenge him). And thirdly, a massive speeding-up of the natural evolution of Homo sapiens into Homo superior; until, by the modern era, they accounted for almost 50% of the global population, providing him with a power base sufficient to take over the governments of the world and use them to oppress baseline humans. It is unclear whether the Scarlet Witch altered the entire Marvel Universe, or merely the structure and history of Earth, a fact further complicated by the events of Secret Invasion. The Skrull Hank Pym stated that there was no way the Skrull army could win against such a vast number of mutants, at least possibly implying the Skrull army was left intact by Wanda's reality warp. Also, Xavier's supposed death in this reality, yet with no body, combined with his own off-planet actions, further confuse the issue. There is a Kree ambassador called Genis-Vell that appears within this illusory reality, and the Kree are shown to be peacefully collaborating with Earth, indicating that such was the Scarlet Witch's power that she was indeed capable of rewriting all of reality, the entire universe. The universe where House of M takes place is designated as Earth-58163. Artwork for a variant cover of House of M 1 (Aug 2005) Art by Joe Quesada. Meanwhile, Xavier arranges a meeting of the Avengers, the X-Men and several lone heroes to Avengers Tower to decide the fate of Wanda Maximoff. Emma Frost concludes that killing Wanda is the only way to end her destructive magic. Captain America argues that the group should seek alternate methods of dealing with Wanda including suppression of her powers and her insanity. The X-Men argue that if word gets out that a mutant with the ability to change reality went insane, it would "send human-mutant relations back to the stone-age." As the conversation progresses, it is revealed that Professor X asked Doctor Strange to help Wanda, but unfortunately neither was strong enough to combat her magic. Wolverine speaks up, saying that there is no other way—Wanda must be killed. The rest of the group decides that they must talk to Wanda in person before making their decision. Back in Genosha, a distraught Quicksilver rushes to Magneto and reveals that he was just in New York City where he heard that the X-Men and Avengers are planning on killing Wanda. Magneto does not know what to do, and clearly upset asks "What would you have me do?". Quicksilver falls to the floor sobbing and Magneto glances over at his sleeping daughter. Xavier takes the two groups to Genosha, only to discover that Wanda is missing. Suddenly, the members of the group start to disappear one by one. Spider-Man is soon the only one left and becomes engulfed by a white light. All of this is covered in issue #1 of House of M.
When the light departs, the world has changed: Spider-Man is a celebrity married to Gwen Stacy; Cyclops and Emma Frost are married; Doctor Strange is a psychologist; Carol Danvers is Captain Marvel, America's most beloved superhero; Gambit is a criminal; and Steve Rogers is an aged veteran. As the vignettes of their lives are followed, it becomes readily apparent that none of them remember the change. Wolverine recalls all of his lost memories and knows this new world is a lie. He finds the world has changed into one where Homo superior are the dominant species instead of Homo sapiens. Mutants rule humans—and Magneto and his "House of M" rules mutants. Wolverine explains why he knows this world was created by the Scarlet Witch. He theorizes Magneto used her to create a world where everyone's deepest wish was granted. Magneto got the mutant supremacy he always wanted. Spider-Man got a life of happiness and contentment. Wolverine is an Agent of S.H.I.E.L.D. but remembers the world from before 'House of M'. Cage reveals that a little girl named Layla Miller told him almost exactly the same thing days ago. The heroes begin visiting the Avengers and X-Men in their new lives as Layla awakens their true memories. All of this was covered in issue #2 and issue #3 of House of M.
Wolverine and the Human Resistance awaken many heroes to the truth, including Cyclops, Spider-Man, Shadowcat, Doctor Strange, Iron Man, She-Hulk, Daredevil, Rogue, Mystique, Nightcrawler, Toad, and Spider-Woman. Hawkeye becomes distraught over learning of his death and briefly leaves the group. The rest travel to Genosha for a final confrontation with Magneto. Back in Genosha, Magneto receives representatives from around the world to commemorate the mutant triumph over humanity. The heroes attack Magneto and his family directly, while Cloak, Emma Frost, Doctor Strange, and Layla search for Xavier. They find a gravestone with Xavier's name, but Cloak discovers no body buried beneath it. All of this is covered in issue #4 and issue #5 of House of M.
The attacker is Hawkeye, who begins to break down emotionally to Wanda about his death in the real timeline. After a heated exchange, Hawkeye is killed for the second time as one of the Scarlet Witch's antagonized sons uses his mutant powers to "erase" the Avenger. Meanwhile, in the memorial garden, Magneto confronts Emma Frost and Layla Miller, who reveal the truth to Magneto about all that has happened. He then unleashes his wrath on everyone, especially his son Quicksilver. He kills Quicksilver by pummeling him to a bloody pulp with large pieces of steel. Suddenly, the Scarlet Witch appears and returns her brother to life. She begins to lash out, saying "We're freaks, Mutants... You chose this over us and you ruined us... Daddy!" She then utters "No more mutants." Everything turns to white once again. All of this is covered in issue #6 of House of M.
In a blinding flash, the world seemingly returns to normal. The Avengers come together to try to make sense of what happened that night, only to be confronted by a distraught Doctor Strange who states that the "House of M" timeline really took place and its effects are slowly being felt on a wider scale. They later get an alert from the ruins of Avengers Mansion. Investigating, they find Hawkeye's uniform pinned to a wall with his arrows, suggesting Hawkeye is alive. At the Xavier Institute for Higher Learning, most of the students lose their mutant abilities. Emma Frost scans the whole world with Cerebro for mutant activity. She learns the number of mutants in the world has dropped from millions to a few hundred. Meanwhile, Wolverine awakens remembering everything about his past. The X-Men fly to Genosha looking for Magneto and his children. They find Magneto is also powerless, and does not know where Wanda or Quicksilver have gone. The heroes can only guess about what has caused the majority of the mutant population to lose their powers. Xavier is still missing, and Cerebro and Doctor Strange are unable to detect Scarlet Witch. Hank Pym warns that all these powers could not simply vanish, but are contained somewhere, and that because every action has an equal and opposite reaction, the question remains as to what the reaction to these events will be. A colossal red ribbon of energy begins to orbit Earth, implying the return of the Phoenix Force; this would also signal the beginnings of the "Avengers vs. X-Men" storyline. All of this is covered in last two issues #7 and #8 of House of M.
The temporary disappearance of Charles Xavier (he returned in X-Men: Deadly Genesis without his powers), Scarlet Witch, and Quicksilver. Quicksilver's disappearance is explained in the Son of M limited series. Wolverine's total recall of his past, which caused a serious change in his status. Multiple governments and agencies for which he has worked or which have manipulated him consider him to be one of the most dangerous threats to them. Though not explicitly expressed in the House of M series, as of New Avengers #26, Clint Barton has been revived in the Marvel Universe. The Collective, a new villain that destroyed the Canadian superhero team Alpha Flight, was created as a result of the Decimation event. The Collective was apparently formed from all of the mutant energies displaced by Wanda's actions. The Shadow King was able to return to this reality with Shadow-X when Wanda shifted reality. Jim Jaspers was brought back to life and fused with The Fury. The disappearance of Meggan and return of Captain Britain to the United Kingdom as a result of preventing the destruction of all realities from the strain of the House of M rewriting the Earth-616 reality; later Meggan was reportedly taken prisoner by a demon named Plokta. Finally she managed to free herself, reuniting with Captain Britain. Due to the vast depowerment of mutants, America won the super powers war without lifting a finger. The Skrulls gained a massive advantage in their infiltration and sabotage. With so many millions of mutants killed, lost, or powerless, one of the three primary threats Veranke stated was neutralized. With all the mutant energy released, Vulcan, the third Summers brother, was revived from a long slumber. Illyana Rasputin was reborn as Darkchylde. The Exiles begin their Worlds Tour in Exiles #69 to chase down Proteus who has been reborn in this new world. It was their first stop of six. In a May 5, 2008, interview, Brian Michael Bendis indicated that the events of "House of M" play into the "Secret Invasion" storyline. The activities of the Skrulls during "House of M" were covered in New Avengers #45, in which it was revealed that the Skrull agents were able to retain their memories after Wanda altered reality, her powers seemingly unable to detect their true natures and desires, and had attempted to instigate the destruction of the mutants over the alteration. The Skrull queen, still disguised as Jessica Drew, considered the resulting "Decimation" to be a boon to the Skrulls plans as they could now divert the part of their forces intended to deal with Earth's mutant population to other areas. The five-issue limited series House of M: Avengers debuted in November 2007, written by Christos Gage and drawn by Mike Perkins. The series spans from 1979 to the present day and acts as a prequel to the original House of M miniseries, showing the formation of Luke Cage's Human Resistance Movement. The 2008 miniseries Civil War: House of M depicts how Magneto took over the world and made mutants the dominant race, as well as confirming that Xavier is indeed dead in this reality. It also features House of M versions of Bolivar Trask, Bucky Barnes, Burner, Dragoness, Gateway, Graydon Creed, Lifter, Mimic, Nuke, Randall Darby, Slither, the Soviet Super-Soldiers (Crimson Dynamo, Darkstar, Red Guardian, Titanium Man, Ursa Major, Vanguard), Vashti Cleito-Son, and Warlord Krang. Set right after Civil War: House of M, this miniseries depicts how the Hood assembles a gang of the deadliest "sapien" super-criminals: Madame Masque, Absorbing Man, Batroc the Leaper, Blizzard II, Chemistro III, Cobra, Constrictor, Crossbones, Nitro, Sandman, Titania, Wizard, and the Wrecking Crew (Bulldozer, Piledriver, Thunderball, and Wrecker). In the run-up to the 2014 "Spider-Verse" storyline, the Superior Spider-Man (Doctor Octopus's mind in Spider-Man's body) found himself temporarily trapped in the year 2099 with his attempts to return home via a dimensional portal resulting in him witnessing various alternate worlds where other Spider-Men had been killed by a dimension-hopping adversary including a dead Spider-Man in what appeared to be the world of the House of M.
The "House of M "timeline appeared in the 2015 storyline "Secret Wars". Its location on Battleworld is called the Monarchy of M.
In the domain of the Monarchy of M, King Erik Magnus wakes up on his royal bed. He is warm and safe, but he remembers a few times that he’d woken up cold and in danger like the times he’d fought against Namor or the Sentinels. He recalls how the events of this reality led all the mutants to rally under the banner of House M when he called himself Magneto. He’s just happy that he’d lived long enough to see it. With the permission of God Emperor Doom, Magnus is now the ruler here. The people feel safe though some of the elders still remember when the Sentinels who now patrol the streets to protect mutants, used to hunt them. With Agent Wolverine of S.H.I.E.L.D. 's Red Guard piloting the sole sentinel flying overhead and a retinue of mutant agents with him, onlookers below gawk at the sight. In Josie’s Bar, several humans gather to discuss helping Luke Cage take over King Magnus’ throne. Just as he’s getting to the plan, he is interrupted by Wolverine’s Sentinel stepping on him, hurting him badly. The Red Guard agents Magma, Marrow, Mystique, Nightcrawler, Rogue, Sasquatch, and Toad leap out and attack the humans. Wolverine kills Iron Fist and slices off Misty Knight’s cybernetic arm. Still, Misty Knight, Black Cat, and Hawkeye escape. They are chased through the streets until they are rescued by Deathlocket (Deathlok's daughter). They destroy the Sentinel that was chasing them. Back in the Royal Palace, Quicksilver is acting strangely. He is late for his meeting at the trade agreements with the Atlanteans and his sister Lorna Dane notices that he is acting out of character. Quicksilver's other sister Scarlet Witch has her own problems as her children Wiccan and Speed are fighting for human rights, embarrassing their mother. Lorna goes to tell King Magnus about Quicksilver, but Magnus shrugs her off. Meanwhile, Quicksilver swims down to Atlantis to meet with Namor. Apparently, he is in collusion with the Submariner to take over the surface world. King Magnus sits in his study playing chess by himself. He is not alone though as someone or something is chained-up behind his throne. It threatens to kill him and his family, but Magnus is not concerned. In another part of the Monarchy of M, Deathlocket, Hawkeye, Misty Knight, and Black Cat are hiding in the underground base where Deathlocket’s father built hundreds of Deathlok cyborgs. They have limited functionality, but the rebels have a plan. Wiccan and Speed are causing havoc when Wolverine and his S.H.I.E.L.D. team show up. Princess Wanda arrives and tells Wolverine to go away as he’s trying to arrest her children. She breaks him down using her reality manipulation powers and reforms him away from her. Princess Wanda grabs Wiccan and Speed and then departs. The Deathloks attack the base, but they are only a distraction as Hawkeye and his team sneak into King Magnus's chamber. They battle and Hawkeye fires an arrow that hits Magnus. No ordinary arrow, the device on the arrowhead disrupts King Magnus’ mutant power over magnetism, causing the chains that were holding the other being to slacken. Out from behind the throne comes Fin Fang Foom and he throws Magneto into a stone pillar. Princess Lorna comes in to rescue King Magnus and they escape, but not before a huge tidal wave engulfs the entire castle - it is Namor and Prince Pietro, come to dispose of King Magnus. Princess Lorna saved her father and incidentally the human attackers, from drowning. Before King Magnus could kill any of them himself, Lorna stopped him, claiming it would be valuable to keep them alive if they wanted to find a way to restore his powers. Lorna also convinced her father to escape from the Castle so they could figure out what happened. Meanwhile, Prince Pietro took over the reins of the Monarchy of M from the allegedly deceased King Magnus, proclaiming himself as the new King to the nation, and that the Atlanteans had helped repel the attack from the humans that had supposedly cost Magnus' life. Being able to see past his lies, Princess Wanda furiously confronted Pietro about these events, but her brother is able to convince her that the course of action he took was for the best. Meanwhile, the still-depowered King Magnus made a temporary alliance with his would-be assassins in order to achieve a common goal, to overthrow Prince Pietro whose anti-human stance made him an even worse ruler for the humans than King Magnus was. The trade paperbacks collect many of the issues involved with the House of M storyline. Arranged in order, the spines of the books form the House of M logo. It should be noted that each storyline/paperback contains a mostly standalone sidestory, and can be read individually without any continuity problems. Only the House of M miniseries itself deals with the main storyline. ^ "House of M Boffo at 233K". icv2.com. July 25, 2005. Retrieved April 21, 2008. ^ "Top 300 Comics Actual–November 2005". icv2.com. December 19, 2005. Retrieved April 21, 2008. ^ Bendis, Brian (w). House of M #1. "Director's Cut". Marvel Comics. ^ House of M 8, 2005. "My whole life... I remember all of it." ^ DeAngelo IV, Frank; Strom, Marc (May 5, 2008). "Secret Invasion Illumination – Ka-Zar: Brian Bendis dishes on Ka-Zar's upcoming role in Secret Invasion". Marvel.com. ^ "Unlocking the Cage: Gage talks House of M: Avengers". Comic Book Resources. September 4, 2007. ^ The Superior Spider-Man #32. Marvel Comics. ^ House of M Vol. 2 #1. Marvel Comics. ^ House of M Vol. 2 #2. Marvel Comics. ^ House of M Vol. 2 #3. Marvel Comics.